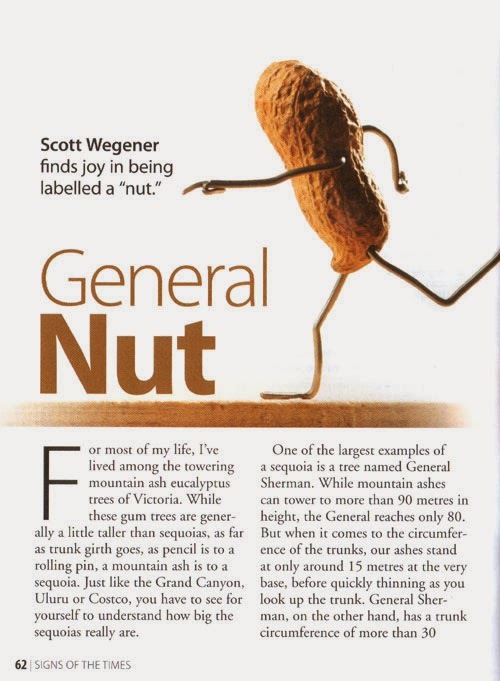 Scott Wegener finds joy in being labelled a "nut." For most of my life, I’ve lived among the towering mountain ash eucalyptus trees of Victoria. While these gum trees are generally a little taller than sequoias, as far as trunk girth goes, as pencil is to a rolling pin, a mountain ash is to a sequoia. Just like the Grand Canyon, Uluru or Costco, you have to see for yourself to understand how big the sequoias really are. One of the largest examples of a sequoia is a tree named General Sherman. While mountain ashes can tower to more than 90 metres in height, the General reaches only 80. But when it comes to the circumference of the trunks, our ashes stand at only around 15 metres at the very base, before quickly thinning as you look up the trunk. General Sherman, on the other hand, has a trunk circumference of more than 30 metres and holds most of that girth up the majority of the tree. You may have seen pictures of trees with tunnels cut through their trunk with cars driving through them. I once had the privilege of walking through one of these living trees and it gave me a great idea. I’d love to plant such a tree in my backyard so I can hollow it out, a little like the inside of a lighthouse. I’d have all sorts of stairways, windows and slides inside. I could set a world record for the longest slinky down-stair walk inside a living tree! Since we’re on the topic of looking into the past, think about how these massive trees started. The gigantic trees we see today all started from a tiny nut (or seed). Sequoia seeds are about five milli-metres long and one millimetre wide. That means General Sherman started at about 0.005m3 and has flourished to some 1487m3! So even though at one time in my life, I found it a little insulting when people called me a nut, in recent years, I’ve figured out the term is actually an expression of affirmation. When people refer to me as a nut, they are simply saying they can see all my potential to flourish into something great, like one of those trees. The big question is, what should I flourish into? I could be a tall tree, but we have plenty of those, and sometimes tall trees are not what’s needed. Growing a giant sequoia in a planter box in a high-rise apartment may not turn out so well in the long term. And a prickly cacti outside a balloon shop may not impress customers as they leave. Not to mention an eggplant bush in a chicken coop would just confuse the poor hens! But all these plants have an important role (except maybe the eggplant), and if we were all the same tree, what a tedious—and even unproductive—world this would be. So I may be a nut and I may “grow” to be something different to others, but I still have an important role to play. The Bible says, “For just as each of us has one body with many members, and these members do not all have the same function, so in Christ we, though many, form one body, and each member belongs to all the others. We have different gifts, according to the grace given to each of us” (Romans 12:4–6). I’m beginning to feel my flourishing may be as some sort of ground cover in this analogy. But that’s OK, I’ll never have to grow up.